The Yamaha pro cornet range has been well represented in recent years by the Xeno series, however the musical demands of modern cornet players has led to the evolution of the NEO range of instruments across some of the traditional Yamahas brass instruments, aimed specifically at brass band players. 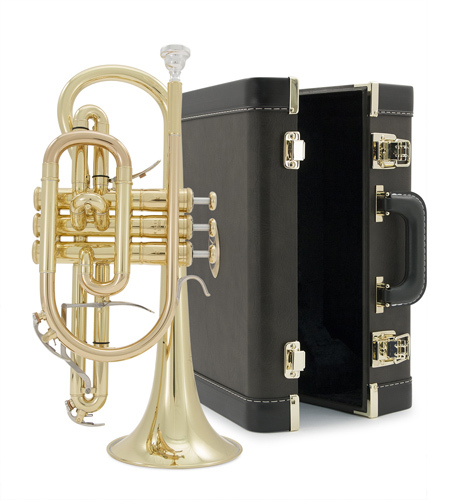 The latest arrival to the NEO family is the YCR8335 cornet. Available in lacquer or silver plate, and with a standard yellow brass or gold brass bell, there is a combination for any players preferences. Listed here is the lacquer 8335 with gold brass bell for extra warmth due to the increased copper content in the base material. Interestingly all the options have a gold brass leadpipe, tuning slide crook and connection tube. Yamaha say the addition of gold brass to these parts of the cornet give a versatile and flexible sound, especially in the higher register. A great deal of testing has gone on in Europe using different brass materials on certain parts of the cornet to try and achieve the authentic brass band feel but with a modern edge to reflect the demands of todays most prominent players. Perhaps on the standard model with yellow brass bell the gold brass fittings help give an element of extra tonal warmth that may have been missing from the original Xeno series. If players want even more of this they can chose the gold brass bell model (8335G or GS) and that is a personal preference. There are a few other subtle changes, even including the type of waterkey spring used, the new version should be even more reliable and long lasting. There is a new case and the addition of a 16E mouthpiece to the outfit, whilst the previous mouthpiece supplied with the Xeno was great for some it did not necessarily suit everyone, the 16E should be a little more universal. In summary, Yamaha seem to have great success with the Neo range so far in the Tenor Horn, Eupohonium and Tuba instruments they have already produced. The feeling amongst the top echelon players is that this new Neo cornet has finally captured that elusive tonal colour that was perhaps missing from previous Yamaha efforts. Well worth a serious look if you need a top level cornet.